If you’ve ever read a book to a small child on the subject of food or digestion, you’ve probably come across the analogy that our stomachs are like a furnace and our digestive system much like an engine. We explain to the youngster that what we eat is important, because our body needs the right fuel in order to operate properly. If little Susie or Danny insisted on eating only candy day after day, their bodies would become weak and sick. In much the same way a coal power plant is like a living organism, eating fuel in order to function. But instead of meats and vegetables, it eats coal, and the coal handling department of a power plant acts as a dinner table. It’s where the food is placed and prepared before it enters the diner’s mouth. The coal our power plants consume comes from one of two places, underground mines or strip mines. It all depends on the particular geology of the area from which the coal is harvested. According to the US Energy Information Administration, underground mines are more common in the eastern United States, while strip mines are more common in the western states. The coal from underground mines is excavated by means of shafts and tunnels which are dug deep beneath the earth’s surface in order to provide access to the buried coal deposits. In strip mines the deposits are just below the surface, so the topsoil is merely stripped away with heavy earthmoving machinery, like bulldozers, to reveal the coal. In both types of mining activity excavating machines and conveyors are required to remove the coal from the mine so it can be loaded for shipment to its ultimate destination. Once harvested, coal is shipped to power plants primarily by train, river barge, or ship. Its journey can cover thousands of miles. It culminates in delivery to a power plant, where it is unloaded by means of a huge piece of machinery called a rotary dumper. This machine is capable of grabbing onto 100 ton railcars and turning them upside down. The coal spills into a large collection hopper positioned next to the railroad track. If the coal has found its way to a plant located near a waterway, that means of transport was most likely have been made by flat barge or ship. In this case a large crane with a clamshell bucket is used for unloading. The crane drops its bucket into a pile of coal located within the ship’s hold, takes out a large bite, then hoists and dumps its contents into a large collection hopper next to the crane. 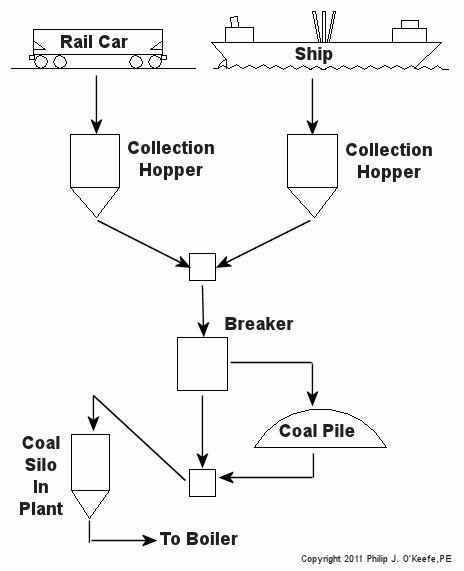 To get an idea of how coal flows within the coal handling system of a power plant, let’s refer to the flow chart in Figure 1. Collection hoppers and have slanted bottoms which allow coal to easily spill out onto a conveyor belt. Within the plant coal is transported by means of conveyors into what’s known as a “breaker building.” This building lives up to its name because it contains a very large machine whose job it is to break the chunks of raw coal that have been harvested from mines into smaller chunks which the boiler can work with. Once broken down, the coal will go to one of two places, either directly into silos or coal bunkers in the power plant building for short term storage, or into an outside storage pile, usually a prominent feature of a power plant due to its formidable size. 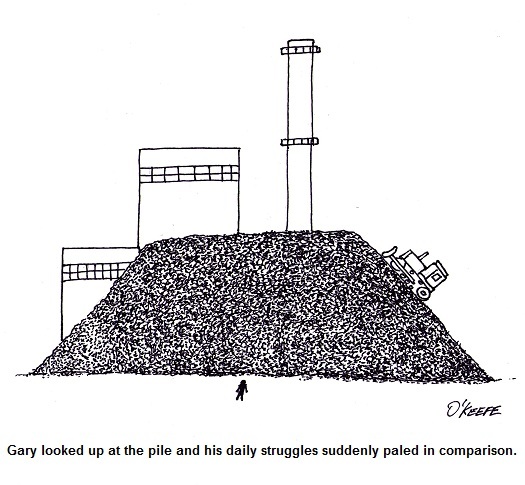 The coal pile can be several stories tall and much larger than a football field. It acts as a reserve supply should the regular delivery of coal be interrupted by labor strike, natural disaster, or equipment failure. When necessary, the coal is removed from the pile and sent into the plant to fill the coal silos. Coal from the silos is used to feed the power plant boilers. Next week we’ll continue to follow coal’s journey, on its way to arguably one of the most important pieces of equipment in a power plant, the boiler.